The first phase of Egypt's parliamentary elections featured a range of minor violations to be expected in any polling process, the head of the African Union (AU) commission to observe the elections said on Wednesday. "When you add all the problems together they don't impeach on the credibility of the elections," Amos Sawyer told Ahram Online after a press conference. 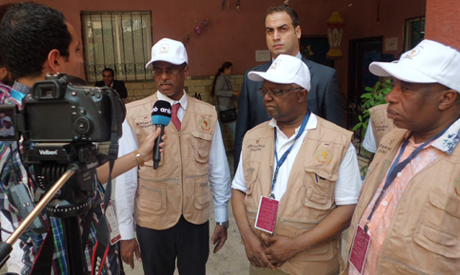 The commission is composed of 35 short-term observers from 19 AU countries who were deployed in nine of the 14 governorates where the first phase of the elections took place. Polling took place on Sunday 18 and Monday 19 October, with the second phase scheduled to take place in the remaining 13 governorates in late November. "People didn't have free access [to polling stations], there were problems with transparency, some people likely were intimidated or told how to vote and there were violations in the vote-counting process and the declaring of results," said Sawyer. Sawyer said the violations also included some polling stations opening 15 to 30 minutes late but "all the people who wanted to vote were able to". "Even when you take into account all the small problems, the overall picture we are convinced of is that the elections were held in an environment that was peaceful, and in a manner that was orderly and that they were credible and transparent," Sawyer stated. The commission's findings are preliminary as they are still to observe the runoffs of the first phase as well as the second phase and its runoffs, and the general environment following polling. The AU commission preliminary report said the average turnout in the polls they visited was 23 percent, "low by international standards" according to Sawyer. The commission visited 455 polling stations. Despite the low turnout, the commission said the participation of women was high. The commission also noted that despite low youth turnout, youth did participate in the electoral process. They recommended "further youth participation." Sawyer asserted that "the legitimacy of the parliament is not affected at all by low turnout ". The commission said in a statement that they "cannot overemphasise the importance of youth in political participation as a politically disempowered or discouraged youth poses a threat to a country's democratic future". The mission noted that the independent and individual candidates are higher in numbers than the parties running for the election which could "make the parliament less party-based and might give rise to a fragmented and weak parliament". Nevertheless Sawyer said that "this is a good beginning" for Egypt. Egypt's parliament ‎will be comprised of 596 members, 448 elected as independents ‎and 120 from party-based lists. The remaining 28 seats ‎will be filled by presidential appointees. The country has been without a parliament since the previous house, elected in late 2011, was dissolved in June 2012 after a court ruled electoral laws unconstitutional. President Abdel-Fattah El-Sisi currently holds legislative powers. Once a parliament is in place, its members will have to vote on the laws issued by El-Sisi and his predecessor, interim president Adly Mansour.